U.S. 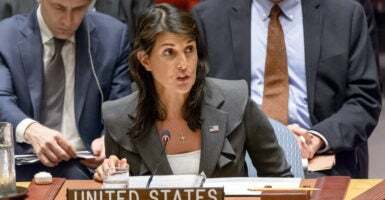 Ambassador to the United Nations Nikki Haley slammed the U.N. resolution blaming Israel for recent violence at the Gaza border. A U.S. amendment to condemn Hamas, a Palestinian Islamist group that governs the Gaza Strip on Israel’s border, failed Wednesday when it garnered a simple majority but fell short of the two-thirds vote needed. The resolution that passed did not even mention Hamas, which has fired more than 100 rockets at Israel. The resolution comes after Palestinian fighters broke a de-facto truce between Israel and the Gaza Strip by launching two rockets at Israel on June 2. The truce served as a short respite after an outbreak of violence in May that rivaled the intensity of the 2014 war between Israel and Gaza that left more than 2,000 dead. Gaza, which is populated by Palestinian Arabs, has been ruled by Hamas since 2007. Although many members of the U.N. General Assembly supported the resolution sponsored by Arab and Islamic nations, others working for the U.N. see the conflict between Israel and Gaza differently. U.N. Middle East peace envoy Nickolay Mladenov of Bulgaria tweeted, “It is UNACCEPTABLE to indiscriminately fire at civilian communities! I am deeply concerned by today’s rockets fired by Palestinian militants towards Southern Israel, one of which hit close to a kindergarten. Such actions undermine efforts to improve the situation in Gaza,” during a flare-up in the conflict on May 29.